ProcessThreadsView is a small utility that displays extensive information about all threads of the process that you choose. The threads information currently includes the ThreadID, Context Switches Count, Priority, Created Time, User/Kernel Time, Number of Windows, Window Title, Start Address, and more. 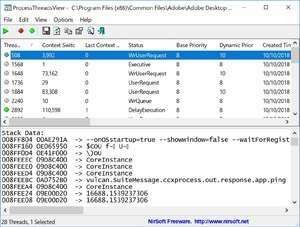 ProcessThreadsView is a small utility that displays extensive information about all threads of the process that you choose. For security reasons, you should also check out the ProcessThreadsView download at LO4D.com which includes virus and malware tests. Additional screenshots of this application download may be available, too. ProcessThreadsView has a presence on social networks. ProcessThreadsView download been highly rated by our users.